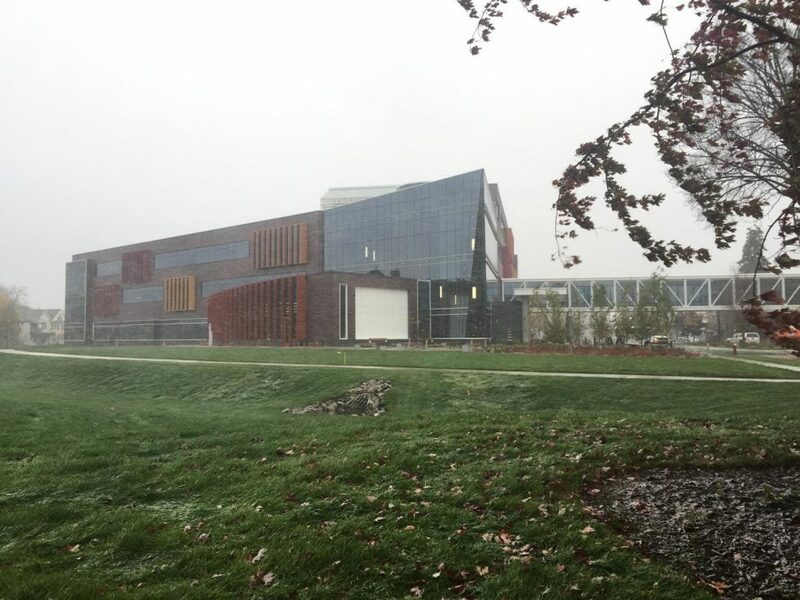 The first snow flurries of the season fall on Hagfors Center site. The window sill in the flexible classroom is made from elm wood reclaimed from a tree that had been located north of Anderson Residence Hall before it was removed due to Dutch Elm disease. The first snow flurries of 2017 fell last week (see photo above) as construction crews prepare for final walkthroughs and inspections in the Hagfors Center, which are expected to occur over the next couple of weeks. Flexible classroom finishes. 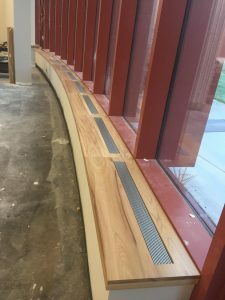 Inside the flexible classroom, crews have installed an elm wood window sill (see photo at right) using wood reclaimed from the elm tree that stood just north of Anderson Residence Hall before it succumbed to Dutch Elm disease in the summer of 2016. The window sill was glued together in one, single piece, and then installed in the space. The reclaimed elm wood will also be used for the window sills in the main lobby, which crews are installing this week. Flooring. Installation of rubber tile flooring is underway in the fourth-floor corridors and labs. Furniture. Office furniture deliveries and installation will begin this week. These deliveries may involve large truck traffic to the site. 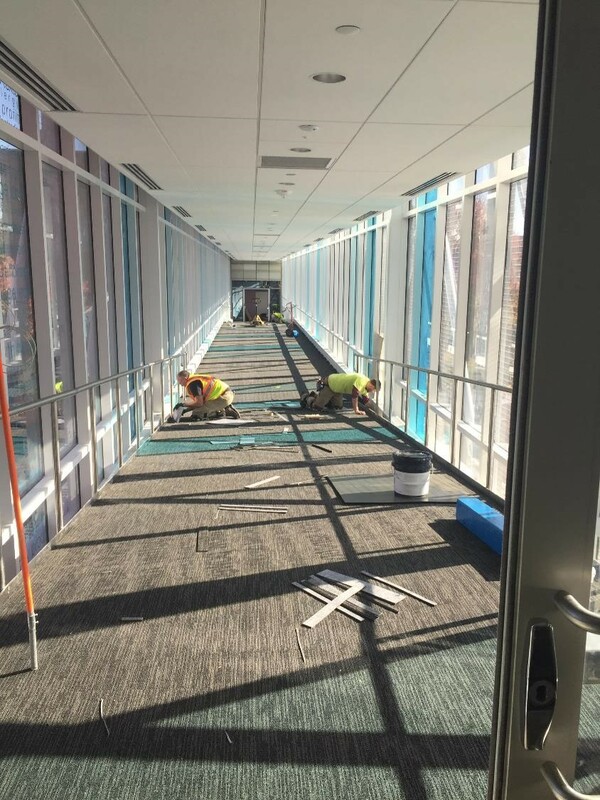 Crews completed carpet installation in the skyway last week. Skyway carpeting. 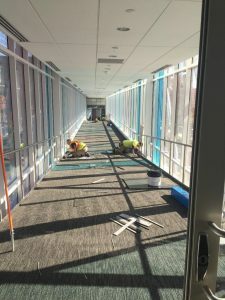 Carpet installation in the skyway has been completed. The photo below, at right, shows crews in the process of laying the carpet last week. Grow room lights. 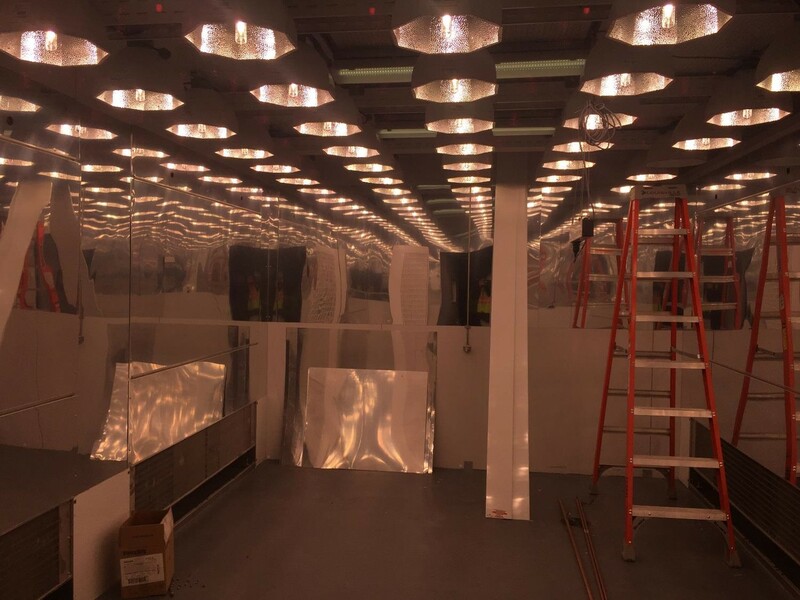 Light bulbs have been installed in the grow room. (See photo, below, at left.) When illuminated, the lights shine as bright as the lights of a tanning booth. 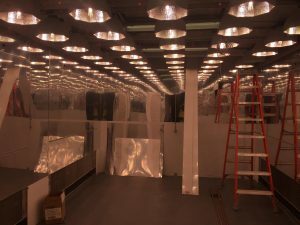 Light bulbs have been installed in the grow room.